John Larkin (we will get to the Lorkin bit directly) was born in the village of Ferbane. John was the son of Michael Larkin a farmer and Mary Cantwell of Ferbane. John was baptised on the 5th March 1828. This information was gained from the church records at St Mary’s Ferbane. His godparents were Michael Cantwell and Mary Larkin. John’s parents had married in Ferbane on the 14th June 1823 in St. Mary’s Catholic church in Ferbane. John’s brother Michael was born in 1830 and recorded in the same church. Ferbane hugs the north bank of the river Brosna. Nowadays the County where Ferbane sits is called Offaly. Back in John’s time however it was known as Kings County. The Kilcolgan of family lore appears as a series of place names in and around Ferbane. In fact it is highly likely that John was born in a house with Kilcolgan in the street name in Ferbane. In Ferbane there is a Cantwell Street and also a good representation historically of Cantwell’s and Larkins. These are the original families our Lorkin ancestors came from before coming to Australia. I know that John had a brother Thomas who stayed behind in Ireland after he and his brother Michael emigrated. John to Australia and Michael to America. Michael emigrated to America and appears in the census in 1854 Monroe, in New York. Through the very great kindness of an American cousin of ours we have been provided a generous transcript of a letter that John wrote to his brother Michael from Australia. I received your letter this day which gave me great consolation to hear from you and which I now hasten to answer. I understand by your _______ you would like to go home to see your father and afterwards come out here. I agree with you in that view for if you come here, you shall never again see your dear father. Should you go home the sooner you do the better. Don’t forget writing to me when you land in Ireland you can use your own digression as to how long you intend to stop at home. I can see that your wages in America is about L28″0″2 per week and found withal. I will say that your yearly salary to be 150 for perhaps 60. But recollect you will have to pay out of that for washing, mending, etc. Now dear Michael if you should go to Ireland, I hope you will not stop long there if you intend to come here for the sooner the better. The passage money from Ireland to Australia is at present to this place L20 so that for you to go home would not increase any additional expense so you can do as you think proper. (A wonderful insight to how our John was doing upon arrival in Melbourne, he was still a single man at this time it would appear given his references to washing and mending – a wife would have taken care of these tasks.) Where he was living at King Street is right next to the historic blue stone building that was a warehouse (is now the Colonial Hotel) and was there when John was there and is only 1 kilometre from the Queen Victoria Market; – however, the ‘Queen Vic’ (to we Melburnites) did not open until 1878 so this was some years away. All the same markets did operate in these spaces prior to the big market opening. It’s also not surprising that the cost of living for John was so expensive in Melbourne. 1851 heralded the boom of the ‘gold rush’ and diggings had broken out across Victoria in earnest. Melbourne was in the grip of her first time as a boom town. He is right in what he says about the assisted immigrant/bounty program. To be eligible a man needed a wife and preferably a young family and to be of younger years to be considered. The colonies had quite enough single men and were keen to populate the land with what were considered hard-working, church-going families who would bring trades and respectability to what was considered a rabbling settlement of convicts a generation prior. By 1860 things must have improved for Michael as he stayed on in the U.S. and married the widow Elizabeth Hosey in 1860 and thence finished out his life living in the U.S. becoming naturalised in 1861 and dying an old man in 1906. He and Elizabeth had eight children together and a further three by Elizabeth’s first marriage. Quite a large family by any means. In the 1901 (Irish Census), there is a Thomas Larkin living at House No. 5 Kilcolgan More (Ferbane, King’s Co.) He was the head of the house aged 50, married to Bridget Larkin aged 45. Also living with them were their children; Michael (21), Thomas (16) and Cathirine (18). Given his age at the census I doubt he is John’s brother but there is also a widowed Michael Larkin aged 55 living with his grown family at House 7 Kilcolgan Berg. In the 1821 Irish census Kings County is well represented. The Larkin’s appear in goodly numbers. The Cantwell’s not so many. Michael Larken of Kilcolgan twice recorded in the parish collections in 1830. Mary Donovan’s early history is something of a mystery. Born about 1838 in County Cork, Ireland. Mary was the daughter of Michael Donovan and Katherine O Keefe. Whilst Mary’s earlier life is still in the grey (suffice to say she was born around the time that the Irish Famine and it’s effect was in full swing); I think I might have had a bit of a breakthrough. I’m fairly sure (happy to be proved wrong) that Mary and her older brother Daniel (Donovan) both emigrated aboard the Negotiator which left Liverpool for a three month journey to Port Phillip in Victoria and arrived in 1857. Newly available records via Ancestry and the Public Records Office of Victoria have led me down this path. Daniel was working with Mary’s family at Ballanee and working there as an employee for a time. It is clear to me that Daniel who as I understand it did not marry, stayed close to his sisters family his whole life, certainly in Australia. Daniel Donovan died in Ballan in 1900 and is buried not all that far from his sister and brother in law in Ballan New Cemetery. The mode of how John came to Australia, was obviously ship. The date and name of the ship however remain something of a mystery to me. I have gone through several shipping records and not been able to ascertain with certainty where our John is in these records. Why John came to Australia I suspect can be easily reasoned; life in Ireland was particularly challenging The great famine (potato) between 1845 and 1852 caused the death of thousands of Irish and was the instigator of what would become the most famous of Irish migration knows as the Irish Diaspora. Both America and Australia would be major destinations of emigration for the Irish people. From what I understand of family lore as to John’s background in Ireland he had recorded himself at different times in Australia as a gardener and later farmer. I think in Ireland this most likely would have been that he was a small crop farmer or labourer. Two of the most insecure of employments during and following the potato famine. There exists a milieu of recorded stories around the how and why of the famine and if ever a time for Irish and English resentment to build between each other then surely it was at this wretched time in history. I purchased John and Mary’s marriage certificate and was able to gather the following. Married 19th July 1893. (nope not a typo). St Ignatius Church Richmond, Victoria. John was recorded as a widower and Mary as a spinster. They told a bit of fib on their certificate and said they didn’t have any children! John gave his place of birth as Ferbane in Ireland and Mary gave hers as Cork in Ireland. They were married in a Catholic church by a Priest. Their witnesses were William Alfred Bromfield from Southampton in England and Emma Cecilia Condon from New York in America. John records on wedding certificate that he was a widower from September 1889; which begs the question, Was John already married prior to meeting Mary? That would explain why they did not marry til a year before his death. Somewhere between 1858 and the birth of his first child with Mary Donovan in 1864; John turns up in East Ballarat. What was East Ballarat at this time? Only what is now the oldest part of Ballarat and the place where the Diggers, were panning and mining for gold. The area had one of the highest alluvial goldfields in Australia and was dotted by thousands trying their luck. I expect the fact that John was there, he might have been one of those trying to strike it rich? This one has stumped many of the family for as long as anyone can remember. What I was told as a child was that there was another family in the Ballan district whose name was Larkin and they kept getting their mail mixed up. Consequently our John made a decision to change their name to Lorkin. Prior to going onto his own property, John and Mary resided at Ballanee, as servants of the large property. I was told that John was hired as a gardener. My grandmother referred to him as having been the head-gardener; but I don’t know in what context that was meant. It was what her mother had told her. 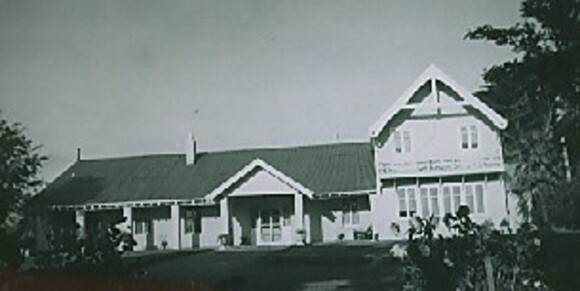 The property of Ballanee at the time the Lorkin’s lived there was owned by C.H.Lyons. Lyons wife, Juliet Lyons kept diaries between January 1862 through to December 1873. Juliet (Anderson)was from a notable Melbourne family and had married Charles Lyons in 1860 and thence came to his home at Ballanee. Our John and family are mentioned in these diaries. John is mentioned in the diaries in relation to the everyday workings of the property. From the research I have done Ballanee homestead and farm supported a substantial amount of people in its employ. From The Australasian (Melbourne) 5 May 1894; A visit to Ballanee. (several years after John’s death). Ballanee, the freehold estate now owned by Mr. Lyon, contains about 2,000 acres, and is situated close to the neat village of Ballan the house being about two miles from the railway station. Crossing the branch of the Werribee that runs by the village, the country rises gently to a small pointed hill named after the old settler, Mount Steiglitz. A good road among pleasant grass-fields leads to the house, which is situated amid an extensive plantation. Like many old Victorian houses, it is a rambling structure with all sorts of surprising rooms tacked on to each other in a most confusing manner. It must be un ideal summer residence for the air (owing to the elevation) is mild in the hottest weather. All descriptions of European flowers and fruits grow in profusion and are of the highest excellence. Where once the view was shut in by the dense sombre forest, one now looks across an open country, with the hills of the volcanic region towards Ballarat for a background. Those hills, once so densely timbered and with such a tangled mass of undergrowth, are now cleared almost to their summits, while around them are some of the finest farms in Australia. John and the family left Ballanee to go to their new home on the 22nd November 1869. They had been at Ballanee for eight years in the employ of the Lyons. Just prior to leaving the Lorkin’s four month old son John died at Ballanee on the 31st of October 1869. He was buried in the Old Ballan Cemetery on the Geelong Road. Juliet Lyon wrote in her diary; ” made a large cross of lillies and box and an immorbla of lillies on a cyprus for the grave of John’s child.” Mrs. Lyons continued to call on the Lorkin family after they left Ballanee. Ballanee Homestead. 136 Ballanee Road. Juliet Lyons, regrettable death at the young age of thirty-five at her father’s house in Melbourne was reported on the 17th March 1874 in The Argus newspaper in Melbourne city. Juliet had had five children with her husband. LYON. -On the 16th inst., at Fairlie-house, South Yarra, Juliet Vivian, the wife of Charles Hugh Lyon and youngest daughter of Colonel Anderson, C.B., K.H. I can only think she must have been a valued friend to the Lorkin family as it appears her daughter later turns up in the papers as a guest at one of the Lorkin family weddings. Her husband Charles Lyon would remain on the property until his death in 1905. 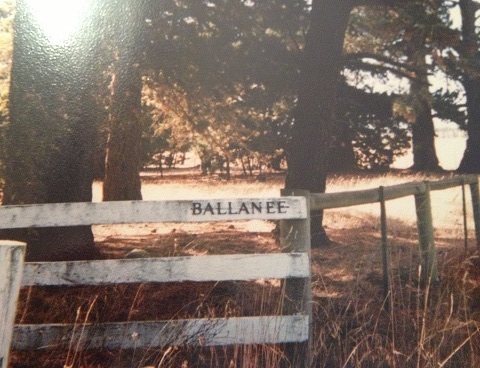 John took up up farming on land along what is now the Blakeville Road at Blakeville not far from Ballanee, via Ballan. The property/area was called Colbrook (in some references it is spelled Colebrook), which it remained until after his and his wife’s death when it was sold up. Farming at Colbrook on what is now called Blakeville Road. At the time the area was known as Colbrook and Ingliston not Blakeville Road. The Lorkin family were well represented in these areas as well as Ballan itself. Colbrook and Ingliston were not towns. From what I have been able to find in the newspaper archives it appears John was running sheep on his property as one of his farming endeavours. This was not uncommon in the area. The Lorkin’s were an Irish family of the Catholic faith and their family church was St. Brigid’s in nearby Ballan. In 1871 John was a gazetted member of the school committee along with some of his neighbours. This would have been a position of some responsibility. At this time it must have borne heavily on John and his fellow committee members that at this time a six year old girl had come out at the end of the school day and had died as a result of drowning in a nearby water-hole. It would appear the area had many such holes for supply of water to the locals. The coroner had been particularly blistering in his condemnation of those in the area for not fencing off the water-holes; particularly as he had only recently attended the inquiry of another child in the area who had died the same way. He gave the school authorities the instruction that all children were to be thoroughly dissuaded from going near the water-holes alone. It was reported in the Bacchus Marsh Express on the 27th September 1873 that John Lorkin of the Shire of Bungal had applied to acquire one hundred and fifty acres from the Local Land Board. He was somewhat fortunate in this endeavour as there was a protest from a Maurice Nash who stated he had an earlier claim to three hundred and twenty acres which encompassed the land John had selected. The case was to go to arbitration as Nash had not yet met all of the criteria of occupancy for the land and if his claim could not be substantiated then the land would go to John. John’s case for addition land selection makes it to Parliament. The Madden brothers who were members of the Legislative Assembly were also natives born at Cork in Ireland and were staunch Catholics. One can ponder whether these links helped John in his case or in what capacity they came to be assisting John with his claim? Lily Mary Lorkin was born at Ballarat East in 1864 she married John George Fowles and they moved to Ferndale where they farmed the rest of their lives at their property Everglade. Lily died at Ferndale in 1937. 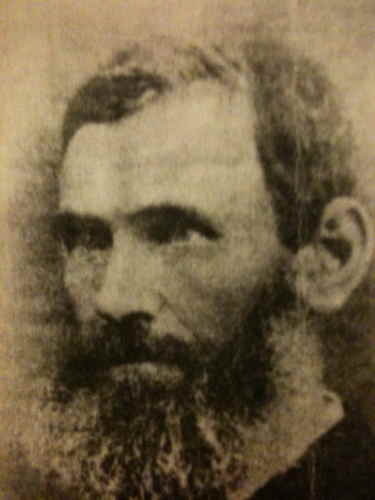 Michael Francis Lorkin born 1865 at Ballanee property in Blakeville, married Hannorah (known as Norah), Agnes Brennan. They lived at Blakeville on their property Blamer’s. After some years they moved their family across to nearby Mid-Hill at Ingliston. It was here that my grandmother used to go and holiday as a child. Michael died in 1943 in Ballarat. Lucy Ellen Lorkin was born at Ballanee property in Blakeville in 1868. She married Albert Edwin Fowles and they moved to Ferndale also where they carried on farming. Lucy died at Warragul in 1949. John Lorkin died as a four month old infant at Ballanee on the 31st October 1869. A further son, also named John Thomas Lorkin was born at Ballanee property in Blakeville in 1872. He married Elizabeth Kennedy on the 18th September 1906.Mr John Lorkin, second son of the late Mr John Lorkin, of Colhrook, was married to Miss Elizabeth Kennedy second daughter of Mr James Kennedy,of Ballan, on Wednesday, I8th September. The ceremony was performed by Rev. Rather Cusack, at St. Agnes’Church, Ballan. The bride, who was given away by her father, was handsomely attired in white silk, trimmed with lace, chiffon, and a spray of orange blossom,. She wore the usual wreath and veil, and carried a white prayer book (gift of Miss Brennan). The bridesmaid was Miss Katie Kennedy, sister of the bride, in cream cashmere, with trimmings of lace and medallion, and carried a bouquet of japonica, with red streamers. She also wore a gold brooch,a gift of the bridegroom. Mr .T. J.Kennedy acted as best man. After the ceremony the party were driven to. The home of the bride’s parents, where the relations add friends sat down : to the wedding breakfast.. The usual toasts were honoured. The happy couple left on the Adelaide’ express for Ballarat anmidst showers of rice and confetti. The bride travelled in a dress of.navy cashmere, Eton coat, and: •with lace and silk, and wore a black Chenile hat. He remained on the farm with his mother until she died in 1915. He had been crippled quite badly as a child in a (cricketing, I vaguely remember being told) accident but still managed to farm successfully. After his mother died he sold the property Colbrook, John Thomas Lorkin had remained with his mother at the home till her death. Later in the year John and Elizabeth moved away from Ballan down to Gippsland where his sisters were living. He and Elizabeth lived the remainder of their lives there, they did not have any children. John died in Warragul in 1950, survived by his wife Elizabeth who wrote a touching tribute to him in The Argus newspaper on the 9th March. James Daniel Lorkin born at Colbrook in 1877, married Susan Jane Dwyer in 1898. LORKINN— DWYER— On the 27th April, at St. Josephs. Warragul. by the Rev. Father Coyne, James Lorkin. of Cabanda, Ferndale. Gippsland, third son of the late John Lorkin. Bald Hills, Ballan, to Susie, youngest daughter of Michael Dwyer, J.P., of “Rockingham, Gippsland, late of Collingwood. James was to have significant hardship in his life. He and Susan would move around, no doubt due to his work between Melbourne (his father in laws home) and country locations. In 1905 James and Susan would have a daughter (they already had a son (James). Then on the 2nd November 1906 James was injured in a work accident. Reported in the newspapers ” James Lorkin, a labourer employed in connection with the construction of additions to the Mount Lyell Mining and Railway Company’s superphosphate works at Yarraville, whilst wheeling a barrow along a plank yesterday, overbalanced and with the barrow fell into a concrete pit almost 7ft in depth. It was found that his arm was broken. The The injured man is married, and resides at Box Hill. Was attended to by Mr. W. H. Donaldson, MR, who then ordered his removal to a hospital. Later that month James wife Susie died, LORKIN.—On the 13th November, at her late residence, Kangerong-road, Box hill, Susan, the dearly beloved wife of James Lorkin and youngest daughter of M. Dwyer, JP., aged 34 years. R.I.P. If this were not enough tragedy sadly more was to follow when a few days before Christmas James and Susie’s daughter also died. 22 December 1906, Hawthorn, Victoria, Australia LORKIN.— On the 22nd December, at No. 58 Power-street, Hawthorn, Catherine, the dearly beloved daughter of James and the late Susan Lorkin, aged 14 months. R.I.P. Daniel Patrick Lorkin was born at Colbrook in 1879. H married Rachael Flynn. They moved to West Australia in the Bunbury area. He died possibly at Geraldton in WA. Their son Daniel would serve in the Royal Australian Air Force during World War II. 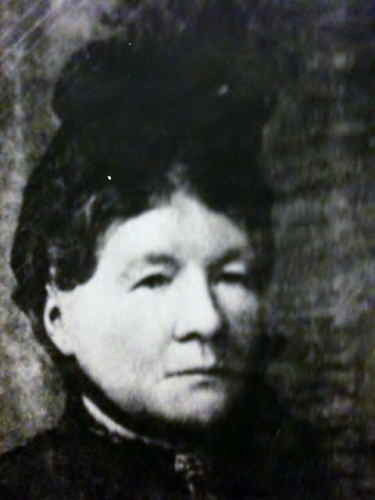 Mary Jane Lorkin was born at Colbrook in 1880. She married Denis James Maher in 1898 and they lived in the Bendigo area. Catherine known as Kate Lorkin was born in Colbrook in 1882. She married widower George Sinclair Fraser or Frazer (not quite sure of spelling as it varies) in 1905. They moved out to Warragul. She died at Warragul in 1962. Bacchus Marsh Express 28th September 1878; Mr. John Larkin asked for 2 pounds compensation for damage to paddock by Thomas Bohan. – The Secretary said that the Engineer had given Bohan an order which made the Council responsible. – The President told the Engineer to be carefule to hold back sufficient of Bohan’s monehy to pay this claim. 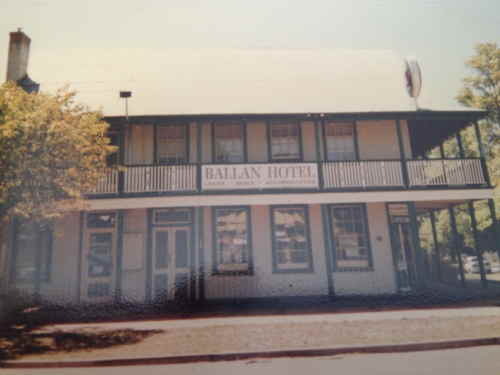 BALLAN. (FROM OUR OWN CORRESPONDENT.) A MAGISTERIAL enquiry was held in the Court house, Ballan, on Tuesday last, before E. Blake, Esq., J.P., respecting the death of one, Denis Craffy, who was found lying in a pool of water on the Blakeville road, dead and stiff. From the evidence given it appears that the deceased left his home, Mr. J. Lorkin’s, near Blakeville, on Sunday morning, stating he was going as far as Ashton’s (about a mile and a quarter distant). Hemust have proceeded into the town, as he was seen by several persons, and on his way home he called at a house, where he got his tea. He then proceeded on his way, calling at Mr. D. Mc’Rae’s, and” asked him to put him on the straight road. Mc’Rae tried to persuade him to remain the night, as it was then about half-past eight, and pretty dark. However, he refused, stating he would be all right if he once got on the road. They left together, and when parting Craffy said “I shall be all right now; I cannot get drowned.” He then left, and was not seen again until the follow ing morning, when he was found as above described by Roderick Steel. Craffy was a resident of Ballan for over twenty years, having been on the Ballanee estate for the greater portion of that time. He was a native of King’s County, Ireland, 68 years of age, a quiet and inoffensive man, and is supposed to be worth about. 300 or £400, which, in all probability, will go to the Government, as it is not supposed he has made a will. He was buried on Wednesday afternoon, in the new cemetery. A large number of his friends followed his remains. The cause of death was suffocation caused by falling into a pool of water, and being unable to rise, the heart and other organs being very much diseased. This is the first I’ve ever heard of Dennis Craffy but I note that he is from the same county as John back in Ireland (Kings). John died on the 19th July 1894 aged 64 years at Ballan. 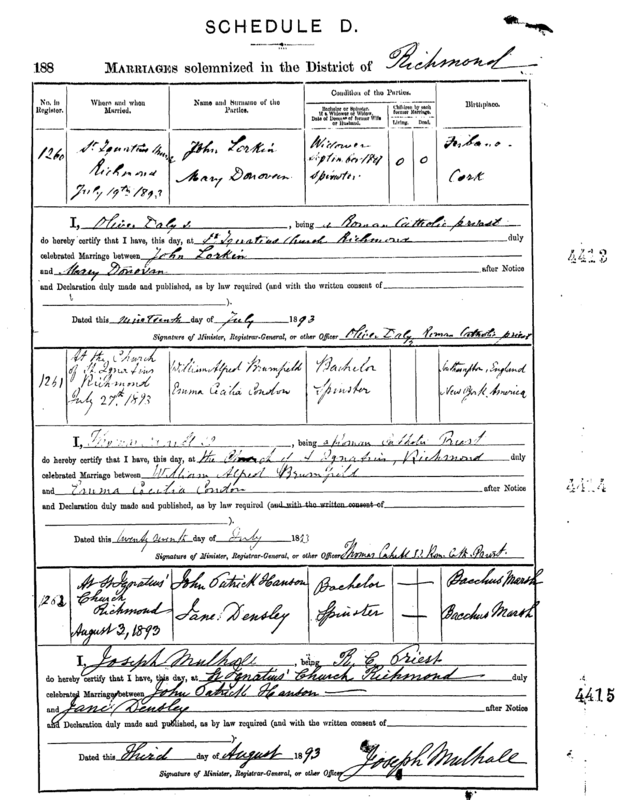 John’s death certificate stated that he died July 1894 and was born Kilcolgan, King’s County, Ireland. He had been 38 years in Victoria. It also stated he had been married for 32 years to Mary Donovan in Melbourne. Nine children, eight living and one deceased. Aged from 31 to 12 years. The son of Michael Larkin (Farmer) and Mary Cantwell. The Bacchus Marsh Express Saturday 28 July 1894 recorded; It is with regret that I have to record the death of another old and respected neighbour, Mr John Lorkin of the Blakeville Road. The deceased has been ailing for some time, and passed away on Thursday night last. The funeral took place on Sunday afternoon, and although the weather was wet and cold was largely attended. Mr. Lorkin had attained the age of 64 yeras and leaves a wife and grown up family to mourn their loss. The funeral of a very old and much-respected resident, Mr John Lorkin, who died on Thursday took place yesterday, and notwithstanding the cold, wet weather, was attended by a large number of persons. The deceased, who was over 60 years of age leaves several sons and daughters, most of whom are grown up, and a widow in comfortable circumstances. Table Talk (Melbourne) Saturday 22 September 1894. The following May on the 11th John Lorkin junior married Hannorah Brennan as reported in the Bacchus Marsh Express: Weddings, like Angels whispers, are with us few and far between, still Mr.Michael Lorkin, son of the late Mr. JohnLorkin, of the Blakeville Road, joined hands with Miss Nora Brennan, of Ingliston, to bravo the battles of life. Thenenuptial knot was tied by the Rev. FatherO’Hanlan in St. Agnes church in thistnownship on Tuesday last. Several losses by fire occurred last week on the Blakeville road, when Mrs.Larkin was a sufferer by tne destruction of the greater portion of her crop, besides a good area of grass and some fencing. Mfr. W. Fowler lost most of his grass, as well as many chains of fencing. Whilst Perkston’s is demolished, and a goodly portion of Lilbourne’s. A grass fire in this township also caused the destruction of fences and grass. The eighteenth of June 1898 was a magnificent day for the Lorkin family at the wedding of John and Mary’s daughter, Mary to Mr. James Maher. The marriage of Mr. Dennis Maher, second eldest son of Mr. James Maher, New Street. Brighton Beach, with Miss Mary Janie Lorkin, third daughter of the late Mr. John Lorkin, Colbrook, Ballan, took place at the Roman Catholic Church Ballan, on June 8. The Rev. Father O’Hanlon officiating. The bride, who was given away by her brother, wore a soft white dress, the bodice trimmed with lace and ribbon. Long tulle veil embroidered with silk and fixed with a spray of orange blossom; she was attended by her sister, Miss Katie Lorkin, who was in French grey cloth, with tucked white front and pink bebe ribbon; large white picture hat, trimmed with chiffon and feathers, and wore a gold heart brooch with ruby and pearls (gift of the bridegroom), the best man was Mr. J. Jamieson. After the ceremony breakfast was served in the dining room of Colbrook. A dance was given in the evening. Following are some of the presents: – Bridegroom to bride, emerald and ruby ring, bride to bridegroom opal and gold sleeve links. father of bridegroom, cheque, mother of bride, cheque and house linen, Miss Lyon Table linen, Mrs Stawell breakfast set, Mr and Mrs Egan silver breakfast cruet, Mr and Mrs M Lorkin claret jug and glasses, Miss Burnside table cutlery, Mr and MRs Potter china tea set, Mr W Lay afternoon tea service, Mr and Mrs J Healey cheque, Mr and Mrs H gray (Kew) Sideboard, Mr and Mrs J Conroy, cheque, Mr Crawford lamp with shade, Misses Wakeham, Sawers and Carter, centrepiece for table and bedroom bag, Mr Shaw house linen. A week before Mary died her daughter Lily Fowles returned to Blakeville to be with her and the family. She returned to Ferndale after the funeral. One of the early pioneers of this district in the person of Mrs Lorkin of Colebrook, on Friday last, aged 77 years. Residing in this district since the early sixties, she was widely known and respected. All who came in contact with her were at once attracted by her kindly and generous disposition and great sympathy is expressed with her family in their bereavement. The funeral which took place on Sunday last, was largely attended, residents from all parts of the district being present. The interment took place at the Ballan New Cemetery, service at the grave being conducted by the Reverend Father McMahon. The pall-bearers were Messrs; J. Egan, W.J. Andrew, J. Rigney, H. Densley, J. Egan, J.O’Shea and S. Hunt; the coffin bearers being Messrs; Jas. Darcy, J. Bowman, E. Wheelehan, D. McIntosh, J. Egan, L. Higgott and M. Nolan. The mortuary arrangements were carried out by Mr. F.J. Mehrens. John and Lily are both buried at the New Ballan Cemetery. 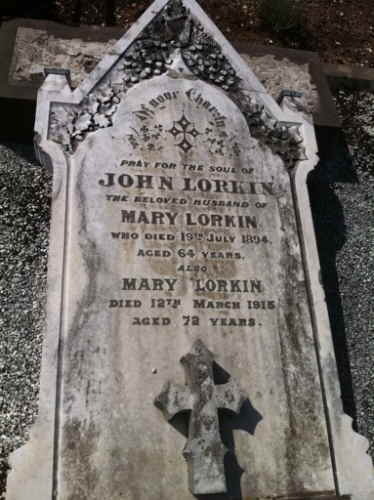 The inscription on their headstone reads; Pray for the soul of John Lorkin the beloved husband of Mary Lorkin who died 19th July 1894 aged 64 years. Also Mary Lorkin died 12th March 1915 aged 72 years. When John and Mary’s son Michael Francis Lorkin died in 1943 his obituary in the Ballan Times gave a description of life in the early Blakeville district. 18th March, 1943 – It is with extreme regret that we record the death of Mr. Michael Lorkin, well known and highly esteemed resident of Ingliston, who passed away at Ballarat on Thursday last after a long illness. The late Mr. Lorkin was 77 years of age, was born at Ballanee and spent his early life at Colbrook, where his parents conducted the farm now owned by Mr. C.H. Plattt. About forty years ago he settled on Mt. Darriwell (better known at Mid-Hill) Ingliston, where he successfully carried on mixed farming until ill health caused his retirement about two years ago, when he came to Ballan to reside with his younger daughter, Mrs. W.H. Wheelehan. Although well versed in all current topics, Mr. Lorkin took no part in public affairs but lived a quiet industrious life, at peace with the world and no man’s enemy. He was a staunch adherent of St. Brigid’s church. Mr Lorkin was a most interesting conversationalist, with a retentive memory and his stories were real entertainment. Few knew the bush as Mr. Lorkin. He was a man of jovial and kindly nature with a most pleasant personality, and throughout his lifelong residence in our midst enjoyed widespread popularity and respect. His demise is universally regretted. After Mary’s death the holdings at Colbrook that had made up the Lorkin farm were sold to another local resident and friend of the family CH Platt. I am descended from the Maher family. Denis Maher married Mary Jane Dorkin in 1898. I am wondering if you know what happened to Mary. Do you know what happened to Mary Lorkin? I am a descendant of the Maher family. I am wondering what became of Mary Jane Lorkin who was married to Denis Maher.